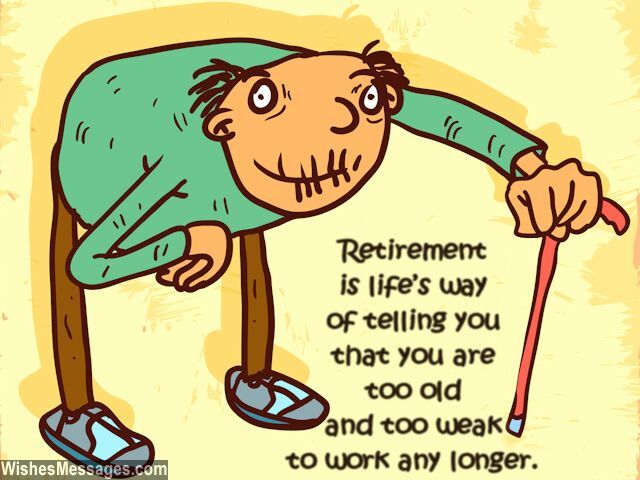 Funny Retirement Wishes: Looking for humorous notes and quirky messages to write on a sweet card or to use in a speech? This post is a roller coaster ride through some of the silliest and funniest quotes about retiring. The best part about is that they will be relatable to just about everyone including teachers, professors, doctors, engineers, IT guys, nurses, accountants, business executives or even the friendly oldie working at the neighborhood supermarket. Read them and think of how you can infuse humor in your greetings. Whether it is for your colleagues, bosses, dad, mom, friends or someone in the family – make sure your witty lines put a smile on the new retiree’s face. Don’t forget to share your words on Facebook and Pinterest. 1) Retirement is the beginning of the time when you can sit back and give advice to others, even though you never followed it in your own life. Congratulations. 2) Old age, fragile bones, doctor visits, medical checkups and a weak bladder – are you still looking forward to retirement? Congratulations. 3) The funny thing about retirement is that it makes you realize the importance of medical insurance. 4) Do you think that life after retirement is an adventure? Well, it is if you count trekking out of bed, climbing atop sofas and diving into takeaways. Have fun. 5) After retirement the body grows older, the heart grows fonder and the mind becomes younger. All the best at trying to handle an old body with a young mind and fond heart. 6) Retirement is the only thing that will make you realize how you wasted all these years trying to be mature when you can get back to being a child at the end of it all. Have fun. 7) Remember all those things that you wanted to do in your life, but didn’t because you never had the time? Don’t plan on doing them after your retirement either – you will either be too old or too poor to afford them now. Wish you a happy retirement. 9) Congratulations for gaining two new best friends upon your retirement. Their names are Bed and Couch. You will be hanging out with them a lot. 10) Retirement is like a never-ending weekend party except that you can’t drink, can’t hook up and can’t stay up all night even if you want to. So in short, it is boring. Congratulations. 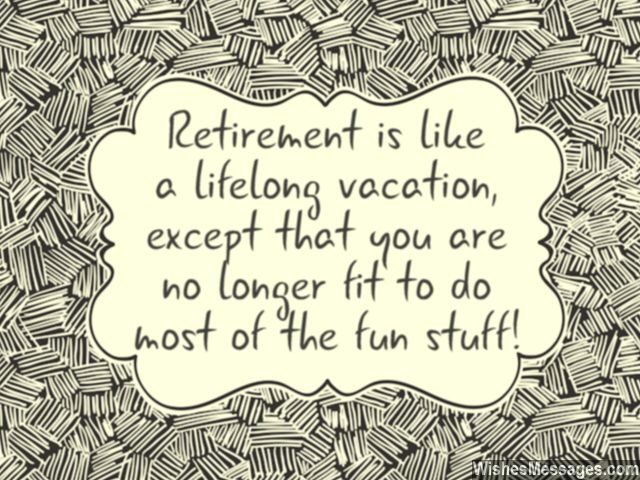 11) Retirement is like a lifelong vacation, except that you are no longer fit to do most of the fun stuff. Congratulations. 12) All your life you sacrificed your health so you could earn more money to retire happily. Now you’ll realize that you’ll be spending all the money to keep up your health. Congratulations. 13) Most people spend their whole lives planning their retirement but when they actually retire, they don’t know what to do. Don’t let this happen to you. 14) Congratulations on your retirement but don’t get too eager to relax yet. Get ready to tire yourself out with grandkids, gardening and many other chores. 15) No matter how many college degrees, skill development courses and professional accreditations you have received, there is one more qualification you will still receive after your retirement – Master of Doing Nothing. Congratulations. 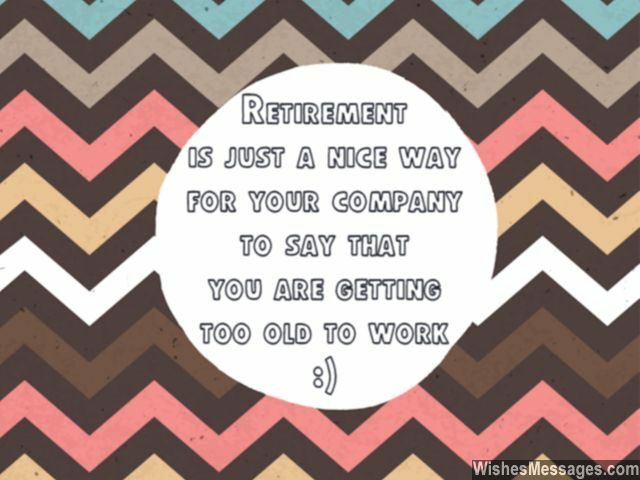 16) Retirement is just a nice way for your company to say that you are getting too old to work. Congratulations for stepping into this league, old timer. 17) Doing the things you always wanted to do is not the real challenge of retirement. Remembering them is the real challenge. Good luck at being a forgetful pensioner. 18) Reaching retirement age is like getting to the top of a cliff. You will be at the zenith of your career, well knowing that the next step is a downward plunge toward old age. Good luck. 19) Some people say that retirement signifies the end of all of life’s tension, but that’s true only if you have a grand pension. 20) Retirement is just a nice way for the company to tell you that they have found more energetic, talented, youthful and skilled staff than you. Happy retirement. 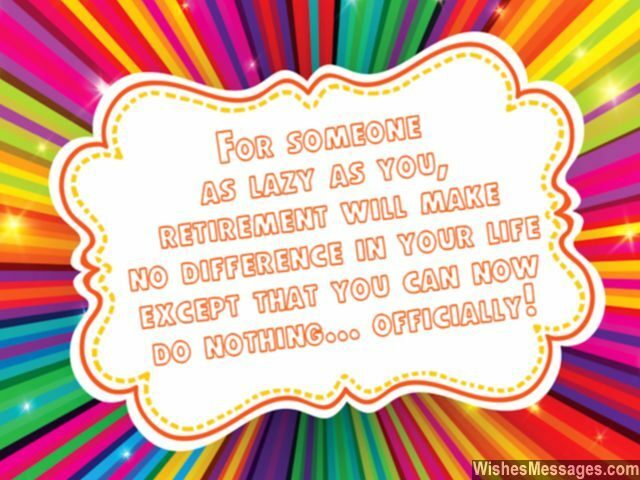 21) For someone as lazy as you, retirement will make no difference in your life except the fact that you can now do nothing, officially. Congratulations. 22) Congratulations for your retirement. Now you will be forced to work on a never-ending project that will take up all your time and it’s called – Doing Nothing. 23) Until now, when you slacked at work your boss shouted at you. Now when you slack at household chores, your wife will shout at you. Happy retirement. 24) Was working hard all your life worth it? You are about to realize that now. Congratulations on retiring. 25) All these years you argued with your colleagues, juniors, managers and your boss at work. After retirement, you will argue with your grandkids, children and wife at home. Life remains the same. 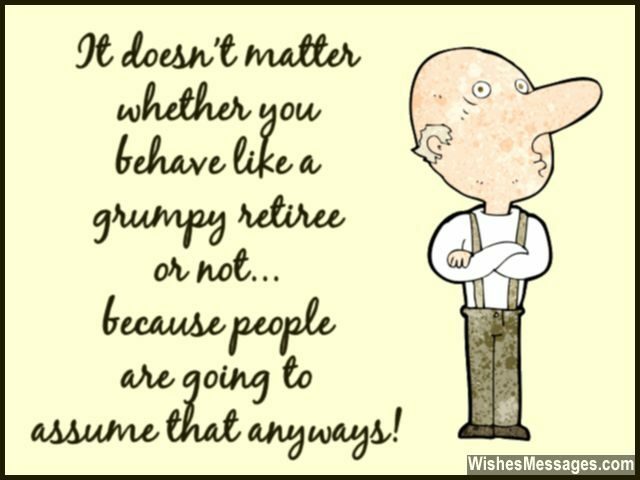 26) It doesn’t matter whether you behave like a grumpy retiree or not, because people are going to assume that anyways. Good luck dealing with that. 27) Consider yourself officially and truly retired on the day you don’t feel like changing your underwear. Good luck. 28) Retirement is the turning point in your life which makes you realize that you had your priorities messed up all this while. Congratulations, better late than never. 29) Retirement marks the transition from working under one boss to a new one called WIFE. Congratulations. 30) Health, family, friends and relationships are some of the things that you sacrificed in your life so that you could work harder and earn more money. Now you will realize that you need these things to enjoy retirement. Such is the irony of life. 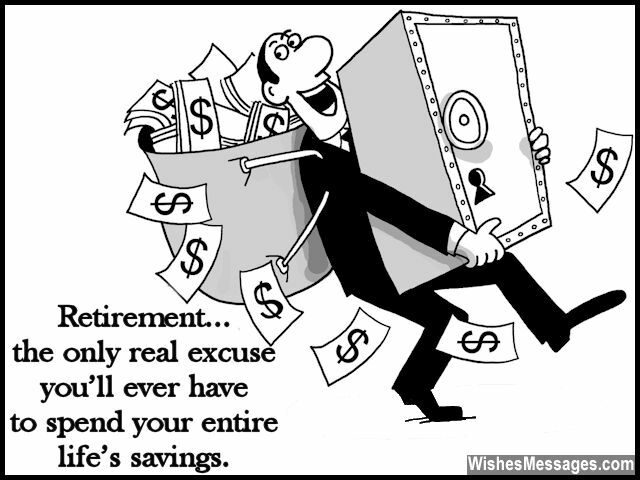 31) Retirement – the only real excuse you’ll ever have to spend your entire life’s savings. Have fun. 32) Retirement is said to be the slow and painful lead up to the sunset years of your life. Have fun old timer. 33) Retirement is a fence – on one side lies hard work and on the other lies boredom. Either ways, it’s no fun. 34) Retirement is like a bubble that burst just when you think you are at the zenith of your career. Good luck buddy. 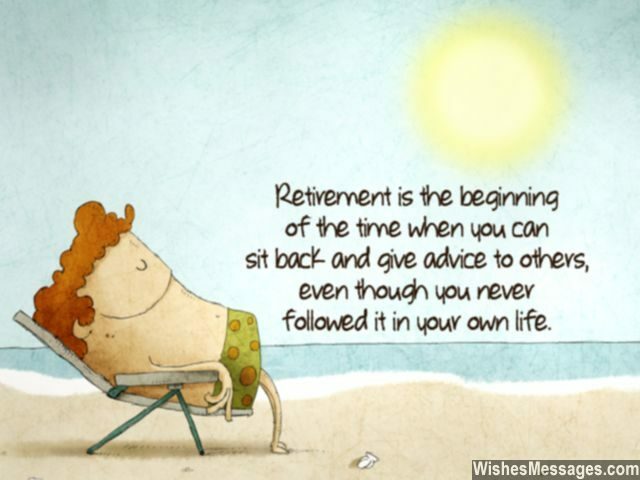 35) Retirement is the company way of indirectly telling you that it has no more use of an old and lazy bum like you. Goodbye. 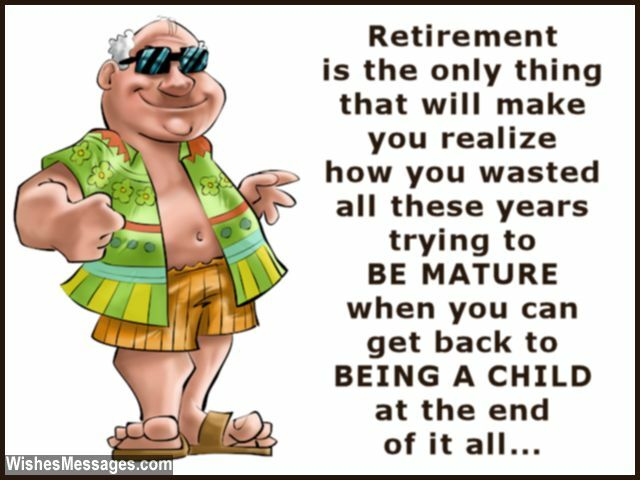 36) Retirement is life’s way of telling you that you are too old and too weak to work any longer. Congratulations. 37) Being retired is the only time in your life when you won’t mind if you don’t get a holiday. Have fun. 38) Every day of your retired life will feel like a happy Friday night. But it’s useless because being old will make you feel dull like Monday morning all the time. Happy retirement. 39) You always cursed your body when you were ill which made you miss an important deadline at work. Retirement is when you will finally curse yourself for using an important deadline at work as an excuse for not taking care of your body all these years. 40) Congratulations on retiring. Have fun watching your life’s savings dwindle out.